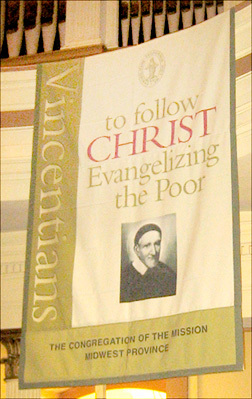 FOUNDED BY ST. VINCENT DE PAUL, patron of all charity, the Ladies of Charity responded to the needs of the poor in seventeenth century France. Together with St. Louise de Mariliac, they went quietly about their tasks, seeking no recognition, satisfied with the knowledge that they were serving Christ in the person of the poor. THE LADIES OF CHARITY, since their origin, have possessed the charism of their founder, daily prayer and personal service to the poor. That same Vincentian spirit characterizes the Association today. It asks the personal gift of self, of time, devotion, sacrifices, and perseverance in the effort to bring dignity to each person and to respond with compassion to every human misery.